Luxury Lawn Natural is one of PolyTurf's top-of-the-line landscaping grasses. 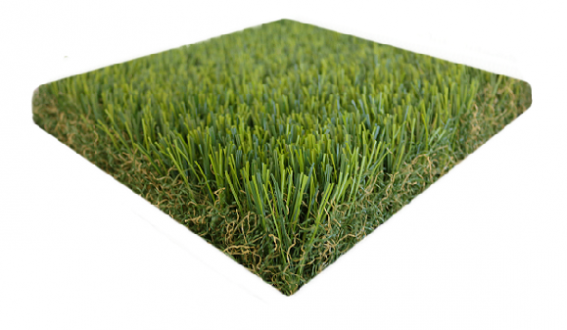 It is the top choice for the ultimate luxurious yet realistic looking synthetic turf. Luxury Lawn Natural comes in a beautiful two-tone spring green color with a green and tan thatch, making it a lush and green yet natural looking turf option. Luxury Lawn Natural is thick, resilient, and soft to the touch, while the full thatch zone ensures the grass blades will stand tall without falling flat. Luxury Lawn Natural features PolyTurf's EnviroFlow rapid draining backing which allows for rapid, even drainage throughout. This backing also makes the turf 100% recyclable at the end of its life. If you want the finest, most attractive, thickest, and most natural looking synthetic turf available anywhere, Luxury Lawn Natural is it!